LOWEST PRICES IN FL GUARANTEED! 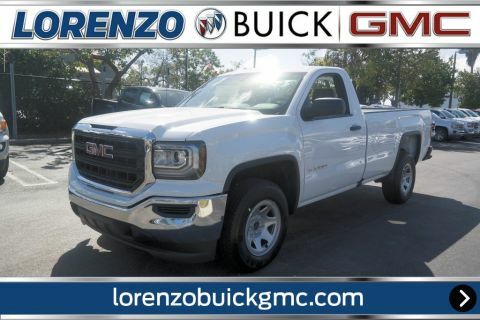 GMC SALE FOR A LIMITED TIME WITH DISCOUNTS OF UP TO $17,000 AND LEASE SPECIALS FROM $199 A MONTH. 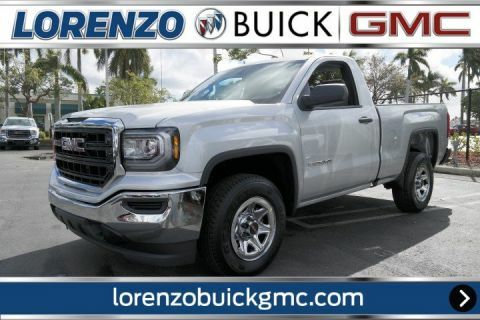 VISIT LORENZO BUICK GMC TODAY LOCATED ON 12 ST AND 84TH AVE IN DORAL.Delivers 24 Highway MPG and 18 City MPG! This GMC Sierra 1500 delivers a Gas/Ethanol V6 4.3L/262 engine powering this Automatic transmission. WORK TRUCK PREFERRED EQUIPMENT GROUP, WHEELS, 17 X 8 (43.2 CM X 20.3 CM) PAINTED STEEL (STD), TRANSMISSION, 6-SPEED AUTOMATIC, ELECTRONICALLY CONTROLLED with overdrive and tow/haul mode. Includes Cruise Grade Braking and Powertrain Grade Braking (STD). 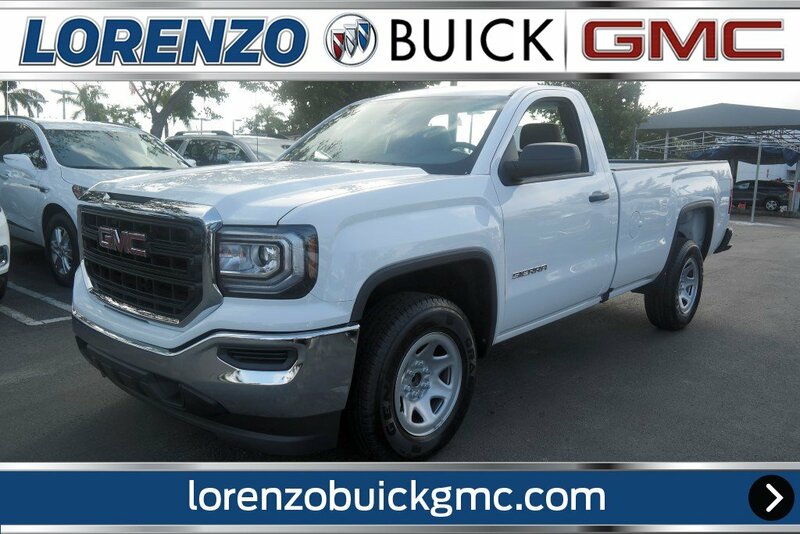 *This GMC Sierra 1500 Features the Following Options *TRAILERING EQUIPMENT includes trailer hitch, 7-pin and 4-pin connectors (Includes (G80) locking rear differential. ), TIRES, P255/70R17 ALL-SEASON, BLACKWALL (STD), SUMMIT WHITE, SEATS, FRONT 40/20/40 SPLIT-BENCH 3-passenger, driver and front passenger recline with outboard head restraints and center fold-down armrest with storage. Vinyl has fixed lumbar and cloth has manually adjustable driver lumbar. (STD), REAR AXLE, 3.23 RATIO, PICKUP BOX (STD), GVWR, 6700 LBS. (3039 KG) (STD), ENGINE, 4.3L ECOTEC3 V6 WITH ACTIVE FUEL MANAGEMENT Direct Injection and Variable Valve Timing, includes aluminum block construction with FlexFuel capability, capable of running on unleaded or up to 85% ethanol (285 hp [212 kW] @ 5300 rpm, 305 lb-ft of torque [413 Nm] @ 3900 rpm) (Includes (FHS) E85 FlexFuel capability. (STD), E85 FLEXFUEL CAPABLE, DIFFERENTIAL, HEAVY-DUTY LOCKING REAR. 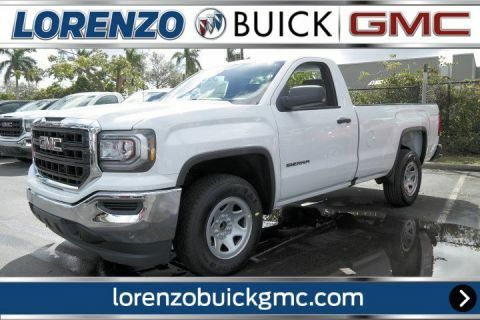 *Stop By Today *For a must-own GMC Sierra 1500 come see us at Lorenzo Buick GMC, 8447 NW 12th St, Miami, FL 33126. Just minutes away!